Looking for first page rankings in Google? Of course you are! In this post, we give you a proven formula for success. Let’s talk first page rankings in Google. You can “win” a top rank by following a tried-and-true formula that’s the staple of SEO professionals everywhere. Here’s the 5-step undisputed formula for first page rankings in Google. Great content marketing starts with keyword research. If you want to land at the top of the search engine results pages (SERPs), make a list of keywords related to your niche and create articles for each of those keywords. But how do you find keywords? You’ll probably need to enlist the aid of tools. Services like SEMRush and SpyFu will help you find great keywords. Even better: they let you find keywords that your competitors are using. If you want to outshine those competitors in the search results, create content that’s even better than their content for the same keywords. We’ll take a look at how to do that in the next section. You can also rank articles for keywords that your competitors aren’t using. Those keywords are often considered “low-hanging fruit” because there’s no competition for them. Once your tools have found some great keywords, don’t stop your research. There are plenty of keywords that you and your teammates should come up with that tools won’t find for you. Think about what kinds of search terms people in your target market might use. Consider colloquialisms that software won’t come up with. That’s how you’ll often stumble across longtail keywords that are often overlooked by the various tools. Some of those keywords can turn into content marketing gold mines. Finally, make sure that you don’t overstuff your keyword throughout the content of the article. If you do that you’ll tell Google that you’re just trying to rank rather than deliver outstanding content. Forget what “they” are saying about the latest SEO shiny object. Stick with what Google is looking for. Create fact-filled, authoritative, readable content. Remember: Google exists to provide its users with information. It does that by essentially crowdsourcing answers to questions from a number of publishers. One of those publishers is you. So if you want your article to rank at the top, make it the authoritative, one-stop source of knowledge related to a specific keyword. That’s a sure-fire way to get to Page 1 because the content is one of the top three ranking signals. One of the other top-ranking signals, RankBrain, is tangentially related to content. It’s Google’s artificial intelligence system that’s designed to deliver superior search results. In other words: if you focus on publishing awesome content, you’re hitting two of the top three Google ranking signals. The results will speak for themselves. Let’s take a look at a few steps you can follow to create amazing content. First, consider what’s already ranking. Fortunately, it’s easy to do that by just Googling the relevant search term. View the top results. Click on the links and look at the content itself. How long is the content? How readable is it? Does it use subheaders? Does it cite facts and figures? Next, compile a series of questions related to the keyword. Put yourself in the shoes of somebody searching for that kind of info and determine what kinds of answers they’re looking for. In fact, you’re going to have to kick it up several notches. You need to produce content far superior to anything that’s currently ranking in the top spots. Some people call that 10x content. Offer more data. Provide more detail. Make it more readable. Use more sources. Sound more authoritative. Be better and you’ll rank better. Here’s another trick when it comes to creating content that ranks: write long-form content. Why? Because longform content outperforms shorter content. Google has admitted that its search results help users find in-depth articles. If you want to rank at the top, write an in-depth article. Also, a 2015 study from HubSpot found that articles with a word count between 2,250 and 2,500 words get the most organic traffic. That same study also showed that articles with more than 2,500 words receive, on average, the highest number of linking domains. Finally, consider upping your content game by adding elements such as video, infographics, and images. When you do that, you’re making it clear to the Googlebot that your content is a comprehensive source of information. As we’ve seen, two of the top three ranking signals are content and RankBrain. The third is backlinking. Google judges the quality of your content, in part, by taking note of how many other authoritative websites link back to it. The theory is that the more sites that link to it, the better the content. That’s why it’s important to follow a great backlinking strategy once you publish your content. Start by looking at everything that ranks on the first page for your keyword. Then, do backlink analysis on each one. For that, you’ll need a tool like Moz or Majestic. Unfortunately, those kinds of tools incur a monthly charge. Consider it the cost of doing business. Once you’ve gathered a list of the backlinks to the top-ranked content, it’s time to rank them. How do you rank them? Start by ranking them from easiest to hardest, in terms of your ability to acquire the link yourself. For example, if you see that a top piece of content has a backlink from Huffington Post, you might rank that one as “difficult.” It’s not easy to get a backlink from Huffington Post. Next, organize the links by most valuable to least valuable. Fortunately, tools like Moz and Majestic make that easy. 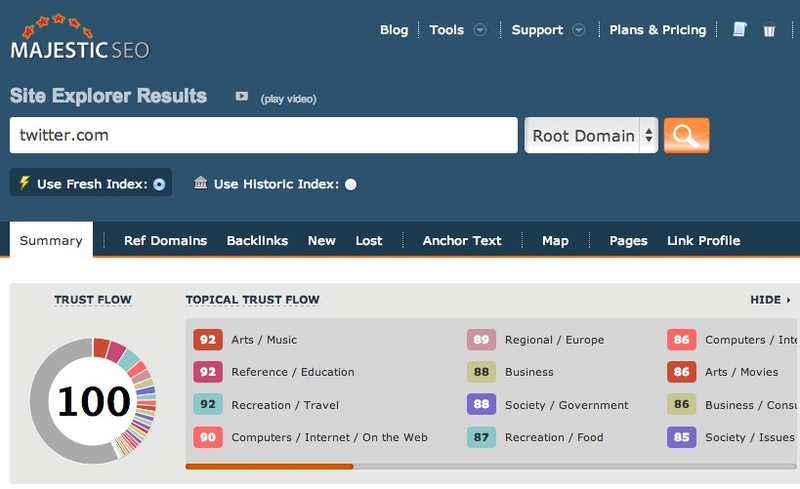 For example, Majestic ranks domains according to two key metrics: Citation Flow (CF) and Trust Flow (TF). They’re both measured on a score from 0 – 100. CF will tell you how many backlinks are pointing to the domain. TF speaks to the quality of the sites posting the backlinks. If you see a domain with a high CF and TF, put that towards the top of your list. Rank domains with single-digit CFs and TFs towards the bottom of your list. Once you’ve organized the backlinks, it’s time to start trying to get your own links from the same domains. First, reach out to the webmasters and ask about guest-posting opportunities. You might be surprised to learn how many publishers are open to that. Second, promote your content on social media and tag the webmasters of those sites. They might notice and give you a backlink. Third, offer link reciprocity to the webmaster. That’s when you link to the webmaster’s site in exchange for a link back to your own site. The best way to get backlinks, though, is to create content that’s so shareable it goes viral. Other publishers will notice and link to your content. Speaking of shareable content, you should make sure that all of your content is shareable. Every now and then, though, you need to create content that’s more than just shareable. You need to create viral content. How do you that? The answer to that is a bit involved. Let’s start with the premise that it’s almost impossible to determine what’s going to go viral ahead of time. Do you think the guy who published the video of his amazement at a double rainbow thought it would go viral? Probably not, but it’s got more than 44 million views as of this writing. Do you think BuzzFeed anticipated that the article asking: “What Colors Are This Dress?” would go viral? Not likely, but it broke the Internet. If the folks at BuzzFeed can’t predict what’s going to go viral, then you probably can’t either. So what should you do to create viral content? Create as much content as possible. When you do that, you increase the odds that something you produce will go viral. It’s a law of averages game. Most of the time, you won’t create viral content. But the one time you do, all those other times will be worth it. Beyond the prospects of going viral, though, create content that’s likely to gain the attention of people in your industry and in your target market. For example, create a study that people can use for reference. Online researchers are always looking for an authoritative answer to a question. Also, give people a reason to get excited about your content. Although we’ve mentioned much about facts and figures, there’s no doubt that you’re more likely to generate buzz when you connect with people emotionally. When you write your content, use a voice that tells readers how much you love your subject. That kind of enthusiasm is contagious. It will also land you some first page rankings. When it comes to SEO, you’re never “done.” You’re always tweaking, testing, and updating. That’s true with content marketing as well. Even if you’ve posted content that scored a hit with your audience, don’t just let it sit still. Update it regularly. One way to update it is by adding fresh links. You’ll almost always come across some new research that validates a point you made in one of your articles. Why not add a link to that research in your content? Also, add an additional paragraph or two that explains the new research. Next, keep up with your internal linking. That’s one area where way too many SEO professionals fall flat. When you add a new article, look for old articles that can reference it. Then, add a link. It’s also important to refine your titles, descriptions, and content. Look for better wording, more clickbaity language, and concise phrasing. You might find that you can attract more visitors with a simple title change. Additionally, analyze the page itself. Take a look at heatmaps so you can see where your visitors spend most of their time. That’s probably where you want to emphasize your most important points. Pay attention to dwell time as well. If you find that people are spending a very short amount of time on your page, then your title is probably good but your lead (the first paragraph) isn’t begging people to read more. Fix that by updating your lead. Give people a reason to read all of your content and you’ll likely gain some first page rankings. Get First Page Rankings Now! To get first page rankings in Google, it takes a lot of work. Assuming you have a strong backlink profile and domain with no penalty, this should get you the search engine rankings you are looking for. I could go on and on about other elements, but these will get headed in the right direction. To learn more about each of these individual elements, check out our 40+ SEO video playlist on YouTube.